Windmill controller driven by Pic Micro Pascal. The board is more compact than the previous ones and unused pins have connector extensions. Those connectors can be used for Serial connection, LCD, or some additional inputs and/or outputs. 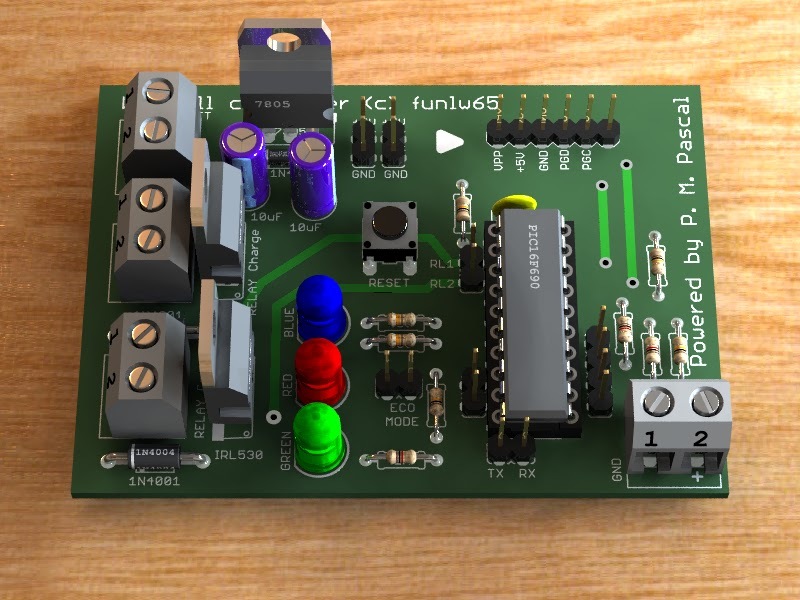 Also, +5Vcc on board voltage is available via 2 connectors for powering external devices as LCD or breadboard connections. There, on board is only a jumper (for charging mode configuration) so, be careful to not short something else. Coming soon! I just realized that I need to build an adjustable power supply first (my old one is not working)! And I have one here as a source of inspiration. Anyway, for now I can go without that adjustable power supply : see here the method I used.